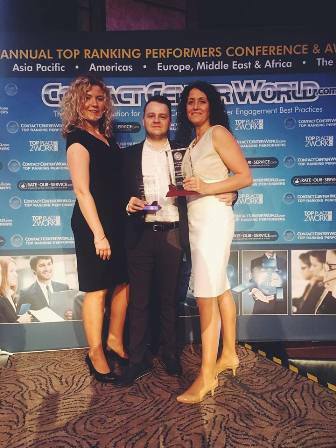 Warsaw June 2nd, 2017 – Mellon Poland today announces that the company has won two awards at the Contact Center World Awards EMEA 2017. More specifically, Mellon received the gold prize for the Best Outbound Campaign and the silver prize for the Best Outsourcing Partnership. These distinctions further strengthen Mellon’s position as a leading contact center services provider. Mellon scooped the gold prize for the “Real Time Management” campaign ran on behalf of mBank, Poland’s fourth largest bank in terms of total assets. The presentation was delivered by Maria Kotsifaki, Business Development Director for the contact center services. The company was also distinguished under the category ‘Best Outsourcing Partnership’ where it participated together with mBank. Bartłomiej Ściblak, Call Center Operations Manager at Mellon Poland, presented the successful collaboration between the two companies that was established 9 years ago. Since 1999, Contact Center World Awards have established itself as a global awards and recognition program. The judging committee, composed of industry’s professionals, evaluated the presentations of the 35 finalists for Europe, Middle East and Africa region that took place from the 22th to the 25th of May. The awards were presented on a special gala that was held on May the 26th, in London, UK. For 8 successive years, the effective collaboration of our teams in Poland and Greece, as well as the excellent results we’ve brought for demanding projects, gave us moments of joy and pride. These important awards underline our commitment to provide top-notch contact center services, following international standards and the industry’s best practices. – commented Katarzyna Cebulska-Bajera, General Manager at Mellon Poland.